To access grades and missing assignments, click on the "Gradebook" tab. You will see a list of classes. Each class can be expanded to view assignment details and current performance. 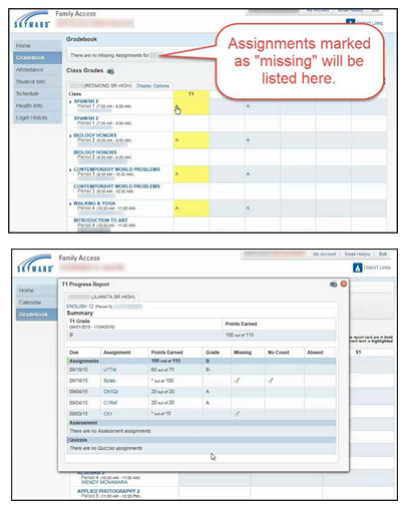 Missing assignments will be listed at the top of the page. Click on the hyperlinked letter grade to view all assignments. If you have any trouble registering for Parent Access or viewing Family Access or the Gradebook, send an email to ParentQuestions@lwsd.org.